This "Historically Speaking" column was published in the Exeter News-Letter on Friday, January 16, 2015. Recently, a time capsule was discovered in the cornerstone of the Massachusetts Statehouse. The contents, placed there by notables including Paul Revere and Samuel Adams, dated back to 1795 when the building was constructed. According to the Boston Globe, the box contained, “five tightly folded newspapers, a medal depicting George Washington, a silver plaque, two dozen coins, including one dating to 1655, and the seal of the Commonwealth of Massachusetts.” The coin, struck with the date ‘1652’ was called a ‘Pine Tree Shilling’ and was one of the earliest coins minted in America. Pine tree shillings were used at a time when colonists were not legally allowed to mint their own coins. Money was in short supply but the local economy was booming. Massachusetts Bay Colony decided that if England wasn’t inclined to send adequate coin their way they’d simply make their own. So what if it was technically illegal? England was going through a rough patch in the 1650s. King Charles I had been beheaded in 1649 and for the next eleven years the nation was ruled as a republic, and the chaos of that period left the colonies somewhat on their own. A coin was designed without the face of a monarch, but with one of the most valuable resources of the Massachusetts Bay Colony – a pine tree. They could have gone with the other valuable asset – a cod fish – but anyone willing to sail to the Grand Banks could catch fish. Pine trees, and lumber in general, grew in the colonies in such abundance that the largely deforested Britain lusted after them, reserving the tallest and straightest for the navy. Putting the pine tree on their illegal coinage was basically showing off. The coins were used – all with the date 1652 – for the next thirty years. It was a time period that coincided with the time when Exeter was part of Massachusetts. We rarely talk about these dark days when New Hampshire and Massachusetts overlapped. It was an uncomfortable period for all involved. Massachusetts ignored English laws at roughly the same rate New Hampshire ignored Massachusetts laws. But in one area they agreed – the pine tree shilling was the favored currency. It’s no wonder that rumors of the coin in Exeter tend to surface. We even have a business building on Court Street called “Pine Tree Shilling.” Older residents may remember it as the Marshall Transportation bus depot, in 1986 it was spruced up and given its new name. Was a hoard of pine tree shillings found on Court Street? 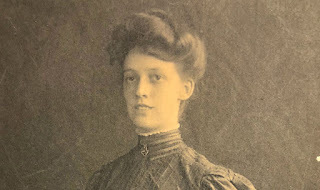 The Massachusetts Statehouse time capsule has reignited the mystery. Pine tree shillings are very valuable on the market today – some in good condition are worth many thousands of dollars. Alas, none of Exeter’s pine tree shillings remained in town. 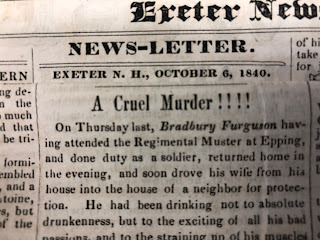 The News-Letter noted, ruining all our dreams, that “the coins found a ready market from twenty-five cents to $2.50.” They are long gone, along with our troubled memories of when Exeter was part of Massachusetts. Caption: The Massachusetts Bay Colony coined pine tree shillings from roughly 1652 – 1680 all with the same date. They were used throughout Massachusetts, New Hampshire and Maine. What a fascinating story! 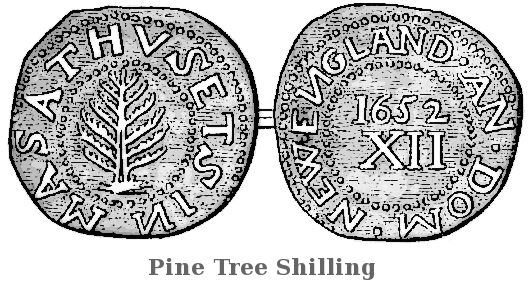 I had never heard of the Pine Tree Shilling. Thanks for this.